Fast approaching its third birthday, the Twitter API has spawned thousands of applications that extend functionality of the basic microblogging service. Some applications mature, while others fade away. The methods and data available through the API continue to evolve, as does the Twitter community, to create new opportunities for application development. This webcast takes a closer look at the Twitter design space by reviewing existing applications across several dimensions and looking for unaddressed needs of the user and developer community. Kevin Makice is currently a Ph.D. student at the Indiana University School of Informatics, the first such doctoral program in the nation. His research interests center around local use of technology and the application of relational psychology to complexity and design. 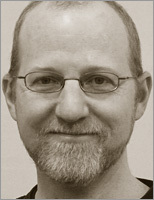 Prior to completing his Masters of Science in Human-Computer Interaction in 2006, Kevin was the primary Internet programmer for TicketsNow, a clearinghouse for sports, theatre, and entertainment tickets available in the secondary market. Along with three others, he won the CHI 2005 student competition by designing a concept for ad-hoc volunteering system for elderly residents in assisted-living centers. Past research includes political wikis, tangible interfaces for children's games, machinima, and network analysis of ball movement in basketball. Much of his blogging and academic efforts over the past year has focused on exploring Twitter as a means of community building.